Prevent Fire Damage In Your Home | MA Restoration Inc.
A fire can be devastating to your home. It is very difficult to prepare for a fire and it is even more difficult to stop one once it has started. Unlike when you are experiencing water damage, you shouldn’t stick around to stop the damage and start fixing it. You should always make sure that you are safe and call the fire department. Do not try to put it out yourself or go back in for your belongings. If you are in need of fire damage repair in Rochester, make sure you call an expert at MA Restoration immediately after you contact the fire department. Here are some ways to prevent fires from happening in your home. One of the best ways to reduce the chance of needing to get fire damage repair in your house is to keep all open flames out of your home. If you smoke cigarettes or cigars, smoke outside, even when it is overly cold or overly warm. This will not only reduce the risk of fire in your home, but it will also reduce the amount of damage to your house. If you smoke in your home, you will likely feel the effects of that when you try to sell in the future. Most buyers will not want to have a home that smells like smoke. So smoking outside is a win-win. Also stay away from candles. Candles can cause fires because many people will light them and forget about them. Instead, you could opt for an outlet potpourri plugin or a wax warmer. If you have a particular candle scent that you love and can’t say goodbye to, just scoop out the wax from the candle onto your wax warmer. 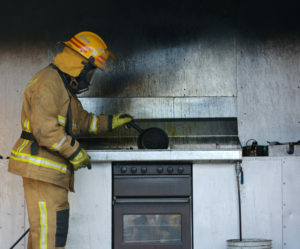 Some appliances can cause fires if you leave them unattended. Many people are guilty of putting a load of laundry into the dryer before they walk out the door, but this could be a big problem, especially if you frequently forget to empty the lint tray. Some people also might use the timed bake feature on an oven, and that is great if you want to start a roast while you are home. However, if you are using it while you are gone, this could be dangerous. If you need to start a meal while you are away, consider using a slow cooker, or you could use an Instapot when you get home in very little time. If you live in an older home, you may want to consider having a professional come check out your electric wiring in your house. Many older homes are not up to code and could have some dangerous wire combinations. If you have your wiring updated you can reduce the risk of needing to hire out for a fire damage repair. Fires can happen even when you do your best to prevent them. Luckily, if you do experience a fire, you know you can call the fire damage repair professionals at MA Restoration.